Clear skies up above. Sun rays shining down. Puppy kisses full of love. Champagne, winding down. Light breeze through the hair. Belly laughs everywhere. This engagement session brought so much joy. 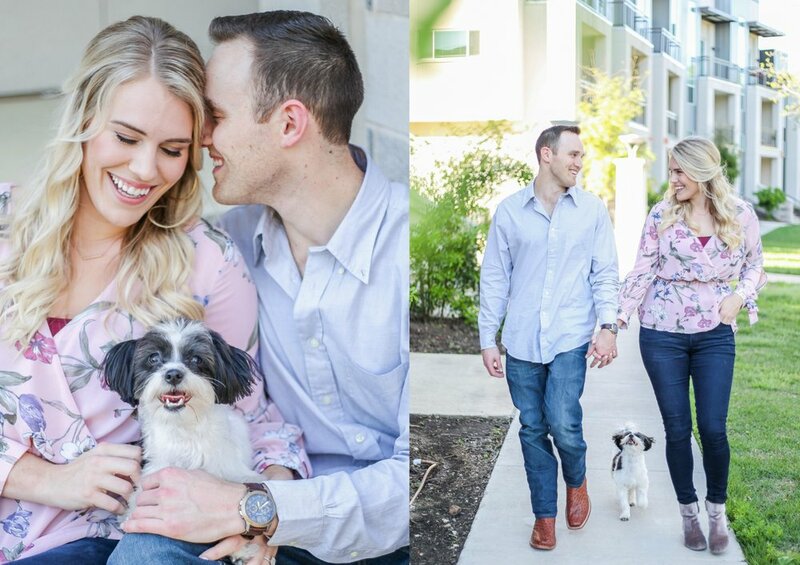 Meet Jake & Abbey...oh yes, and how could I forget to introduce their adorably lovable furbaby, Lucy. We started our session at their beautiful condo off of South Lamar on the stairs leading up to their front door. Just look at this adorable family y'all, seriously! When Abbey & I started to discuss location options they had in mind for their session, she mentioned possibly having part of their session at a restaurant called Mattie's. My eyes immediately lit up when she said the name because I have heard quite a buzz about this refined, but swanky South Austin restaurant. 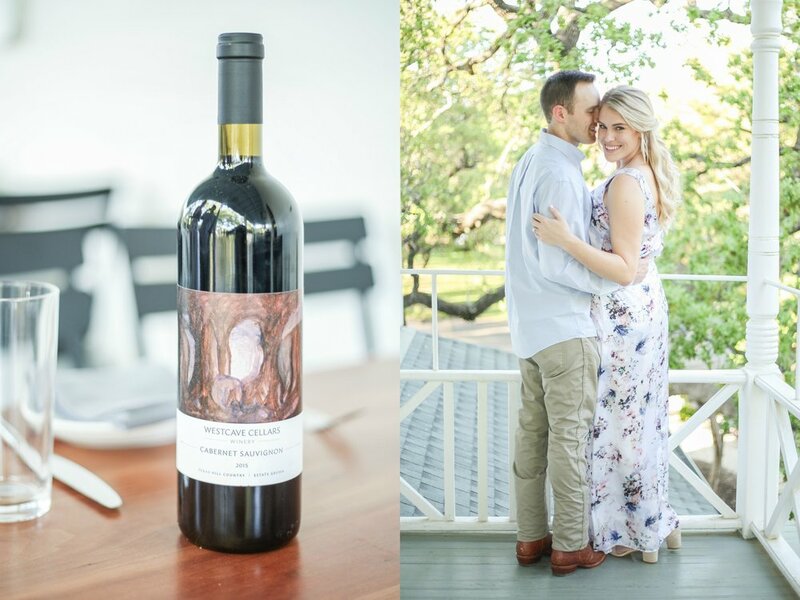 I had seen photos that others had posted taken at Mattie's - they posted them on their chic style blogs as the new "Austin Food Gem". I was very excited to be able to have our photo session at Mattie's & I will say without a doubt, it did not disappoint. This place is absolutely gorgeous! "After high school, we both decided to attend The University of Texas at Austin and both chose to live in Dobie, a freshman dorm just off campus. I was on the 5th floor, and Jake was on the 12th floor. He had moved into to Dobie with his friend from high school, Taylor Brasher, as his roommate. Taylor is actually now our Best Man in our wedding! My friends and I met Taylor in Dobie cafeteria (a lot of kids would hang out there and socialize), and he invited us to come hang out and meet his friends one night after dinner. When we showed up, Jake was there, and that’s where we first met! We all spent the night hanging out playing games, and Jake and I immediately hit it off." Q: Abbey, what’s the story of your proposal? Jake and I actually decided to choose a ring together, so we spent months visiting with different jewelers learning about different cuts of diamonds and settings. We actually chose the loose diamond and the setting of my ring together, but I never got to see the completed ring until he proposed! At the time, I was still living in Dallas, and he had moved back to Austin for a great job opportunity. We would trade off visiting each other on the weekends, and this weekend was my turn to visit Austin. He told me he made plans for us to go to the lake for the weekend, and that he had chosen a house on Air BNB and booked it already. (This tipped me off a little because he never ever books anything on his own, usually I’d be the one doing all the research and planning!) When I arrived, it was close to sunset since I had to drive from Dallas after work. He (and Taylor) had set up a walkway of lights and candles to the deck on this lake house, with a beautiful view of the lake. He had a little table set up with photos of us, and just asked me to marry him right there! As soon as i said yes, people started cheering and all our friends ran out of the lake house (they had been hiding inside and watching through the window). We spent the weekend on the lake celebrating with our best friends. It was an amazing weekend! Abbey & Jake, I had such a great time with y'all on your Engagement Session & I am really looking forward to your wedding day. I hope you two really enjoy this chapter leading up to the big day. Remember to keep laughing, don't stress the small stuff when it comes to the planning process and wake up every day knowing you are very blessed to have one another. 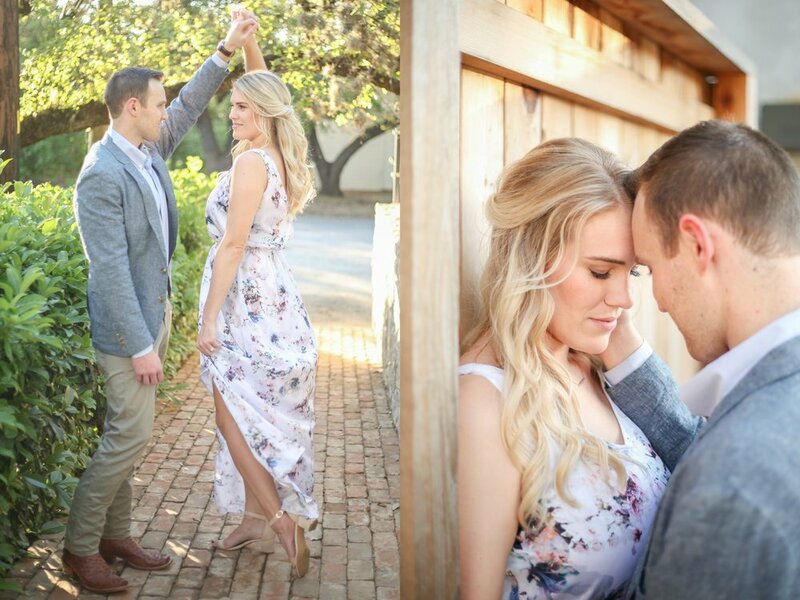 I am honored to be your wedding photographer - let the countdown begin!